This morning Google Wave users received an email informing them that the service will be shut down soon and that any 'Waves' in their account should be downloaded. Google Wave which started life in 2009 was hung out to dry within 3 months of its public release in May 2010 with the search giant ending support for the site, though there was no official statement as to whether the service would be closed altogether. But today Google has finally announced it will pull the plug on the platform which was billed as email reinvented [BBC]. It is not the only service that is being retired however. 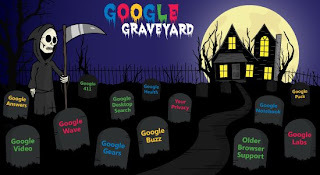 Earlier this year Google Power Meter was closed and Google Health is set to be closed in January 2012. Knol, Google Gears and Google Friends Connect will also join an ever growing list of failed Google projects. Google Bookmarks List, a service which allowed users to share bookmarks with friends, will also be dumped because they did not have the "impact" the company had hoped for. Google said in a blogpost that its aim is "to build a simpler, more intuitive, truly beautiful Google user experience", however there are concerns amongst some observers that the strategy might discourage users from signing up to new services. The company has come under criticism from some of its major rivals recently with Microsoft accusing the company of failing to properly support its customers. In a blogpost entitled "Google Graveyard Spooks Customers," Tom Rizzo, director of Microsoft Office 365, said, "Google's product management process is like cooking spaghetti… Its products are like spaghetti, Google throws them up against the wall to see if they stick." "In attempting to speed products to market, Google has rolled out poorly planned products and racked up a long list of failures," Rizzo said, who doubts Google's commitment to its new baby Google+. With Wave, Buzz and Aardvark all retired, Rizzo suggests the future of Google+ is shaky at best. "In cancelling this group of social media-like services, it is clear that Google is not in tune with the market needs and does not have a product roadmap and clear vision for productivity for their business customers," he says. There have already been concerns from some who use Picasa Web to store photos online after Google tied the service into Google+. Google has changed the way folders or pictures may be shared with others if people have adopted Google+, and name tagging automatically posts the picture to Google+, making other photos in the same folder accessible to the person tagged. Some Google Health users are equally annoyed that they will no longer be able to use the online service. While some never signed up due to privacy concerns, the site enabled people to track their medical history and share with doctors if necessary. Ironically Google suggests Microsoft's Health Vault as an alternative for users who wish to store their medical data online. Google Video users were forced to transfer their content to YouTube, or download their videos, after the company decided to shut down that part of its empire last year. While users of Gmail and Google Docs might feel secure, for now, the latest series of retirements do raise some worries over what Google will dump next.